The E-PROPS propellers are very different from the other propellers. They have special profiles, patented designs, and special position of the blades to reduce the blades drag, so to obtain the best thrust. The E-PROPS team has developed many different models (2-, 3-, 4-, 6-blades), for engines with reducers, in different diameters. Propulsion efficiency factor is calculated from propeller diameter and engine power. 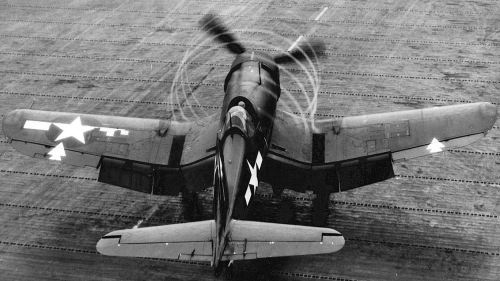 This efficiency factor is the max achievable propeller efficiency. Then, it is up to the propeller designer to come closer to this limit. The E-PROPS design department consists of 8 technicians and engineers. The head of this department is Jérémie Buiatti, who designs propellers since 2006 and has implemented the internal software LmPTR©. This complex software performs a detailed aerodynamic flows analysis and a mechanical behavior analysis of the propeller. It is implemented from an advanced language and contains more than 85.000 code lines. This software allows the team to imagine new propellers concepts, by using particular geometries and profiles developed inhouse. 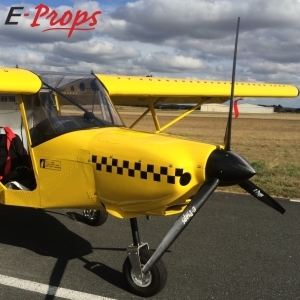 That is why E-PROPS propellers are very different from other propellers proposed at present on the market. When we speak of efficiency, we obviously speak of thrust and also of fuel consumption. A propeller which has a better efficiency allows to reduce the fuel consumption of the engine. The E-PROPS propellers have a thin chord (chord = width of the blade). A thin chord generates less drag than a wide chord and leads to a better efficiency of the propeller, a better thrust, makes less noise and reduces fuel consumption. 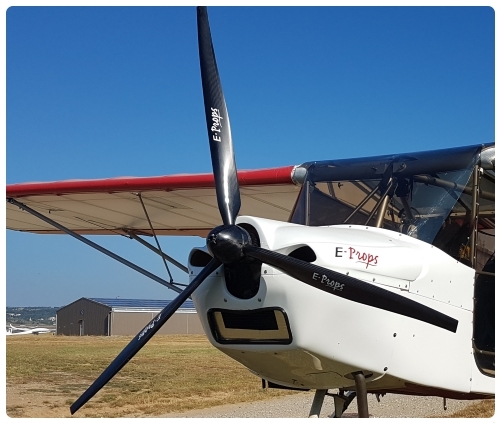 On average, the use of a E-PROPS propeller allows to save between 6 and 9% of fuel at the same engine RPM (it depends on the blades geometries). A best efficiency, it is also a less high noise level. 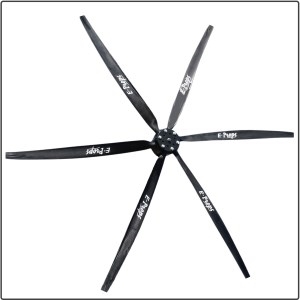 With E-Props designs and profiles, for the same diameter, more blades = more efficiency. A 3-blades has a best efficiency (= a best thrust) than a 2-blades. This is true if the blade form is exactly adapted to the configuration : a blade of a 2-blades propeller mounted on a 3-blades or 4-blades hub would not give the best performances. The "universal" blade for any configuration does not exist. 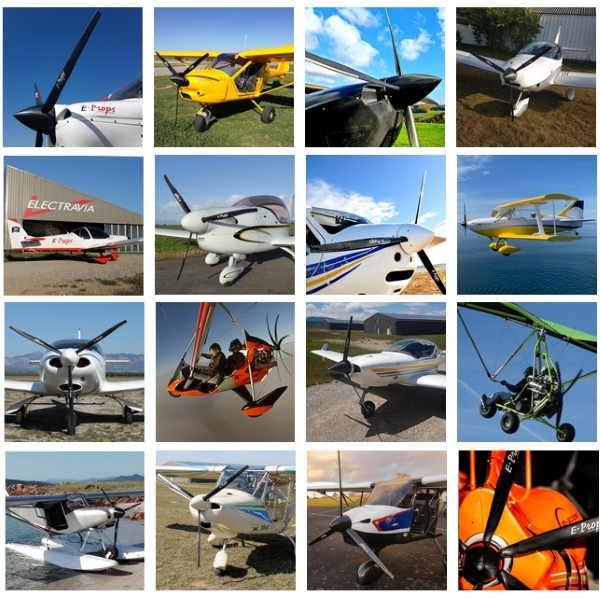 Every propeller has a dedicated blade geometry, or the efficiency would not be the best. The increase of the diameter is better for the efficiency, because of the improvement of the pusher efficiency. More static thrust is obtained with a propeller with a diameter of 180 cm than with a propeller with a diameter of 155 cm. With the same number of blades, the thrust gap depends on the diameters and on the engine + reducer. One data has to be verified : the peripherical speed (on tips) must not exceed Mach 0,65 (800 km/h), or the noise would be too high. Some people are saying that the wake of the third blade of a 3-blade propeller is crossing the wake of the 2 other blades, and this phenomenon decreases the efficiency of the propeller. That's wrong. The wakes of the different blades cannot crossed themselves. It is physically impossible, because the blade's wake is sweeped away by the wind.